With a rustic, textured, metallic finish, the Kiribi Takara stays true to its namesake inspiration, calling to mind sunken treasure found in deep waters. 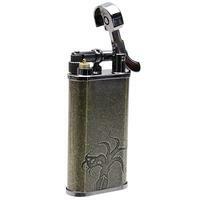 Available in either a silvery Black or the gold coin-like Brass seen here, each lighter is etched with the Kiribi logo and the iconic giant squid on opposite faces. 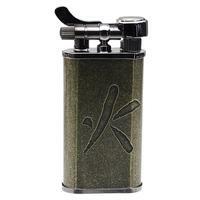 Aesthetics aside, it's quite the functional pipe lighter as well — combining all the high-tech features and convenient cap toggle of the popular Kabuto, only in two bolder finish styles.